The extraordinary life of Anthony Bourdain, one in which the chef, writer, and TV host traversed the globe in pursuit of culture and cuisine, will be the subject of a new biography called Bourdain: The Oral Biography. Food writer Paula Forbes tweeted the news on Wednesday, describing the forthcoming book as "an authorized portrait of the writer, veteran chef, and television traveler, built from stories shared by those who knew him best," set to be published by Ecco Press in 2019. According to Eater, the will book be edited by Laurie Woolever, Bourdain's longtime assistant and co-author of the late chef's cookbook Appetites. The forthcoming biography will be published with permission of Bourdain's estate. Bourdain died of suicide at a hotel in France on June 8 at the age of 61. 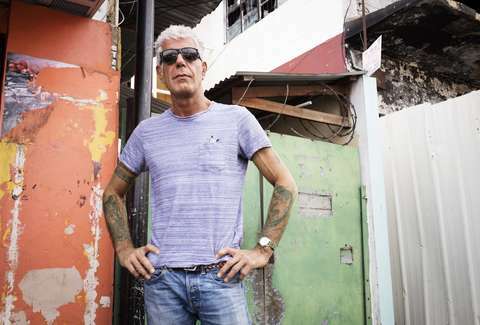 Bourdain rose from the depths of obscurity as a line cook and eventually found imminent success as a chef, author, and television host, most notably crisscrossing the world on CNN's Parts Unknown. His landmark essay on the depravity and squalor of a life in the restaurant business, published in the New Yorker in 1999, birthed his promising literary career. Bourdain later published his memoir Kitchen Confidential, A Cook's Tour, and other books, but it might just be the wisdom he imparted about the power of travel that remains the most salient part of his legacy.